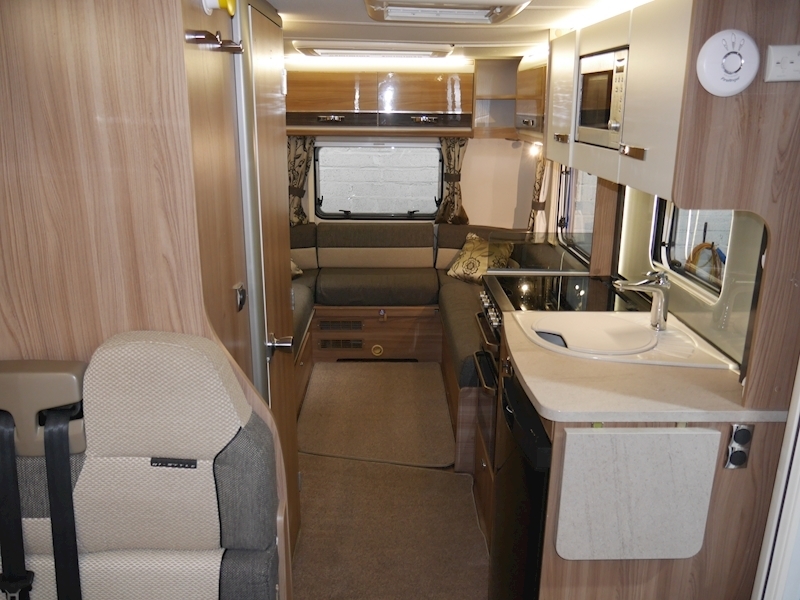 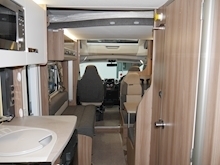 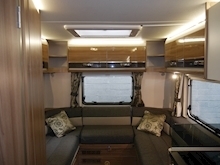 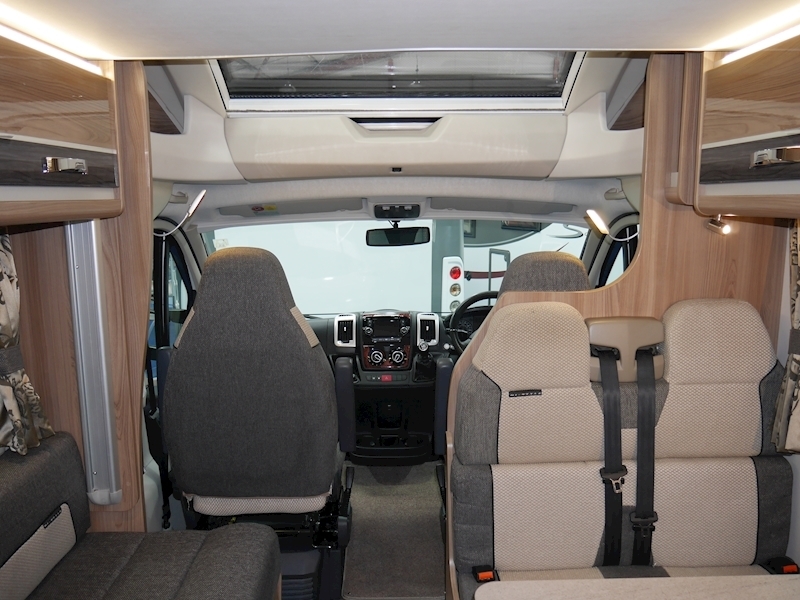 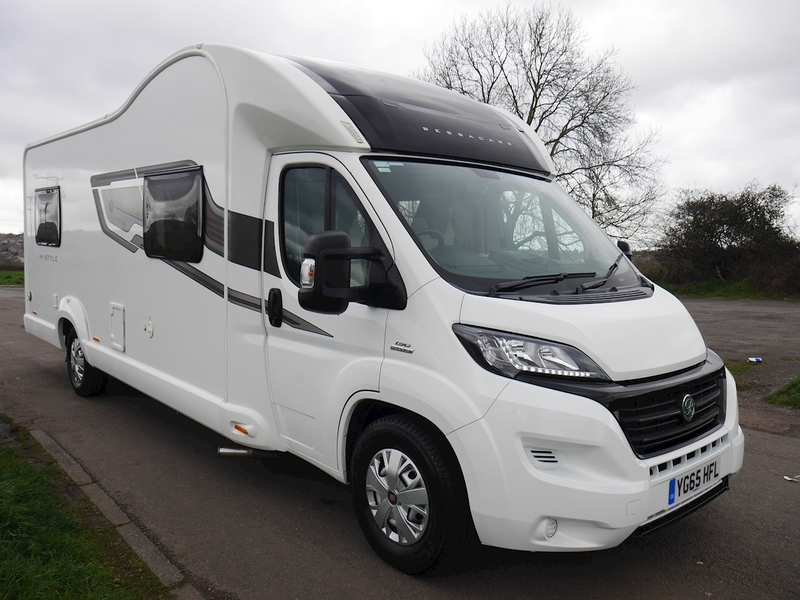 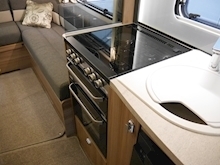 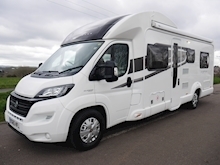 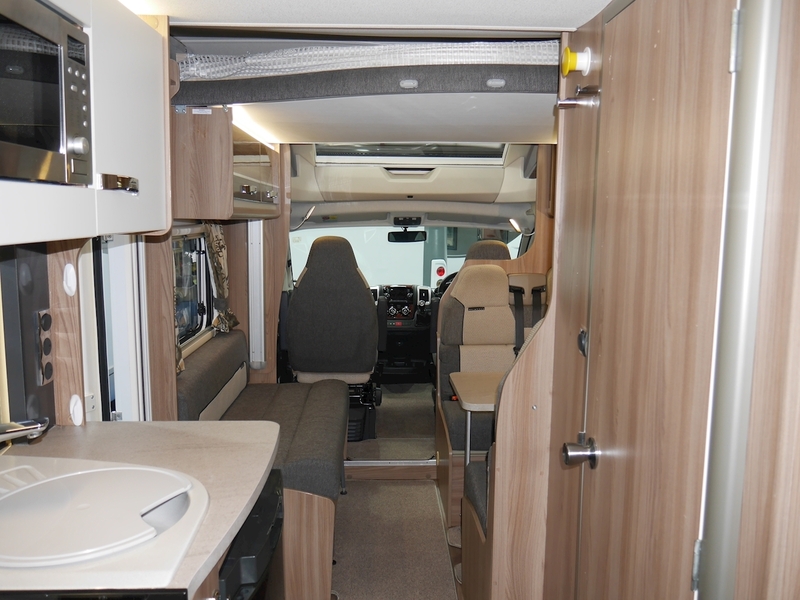 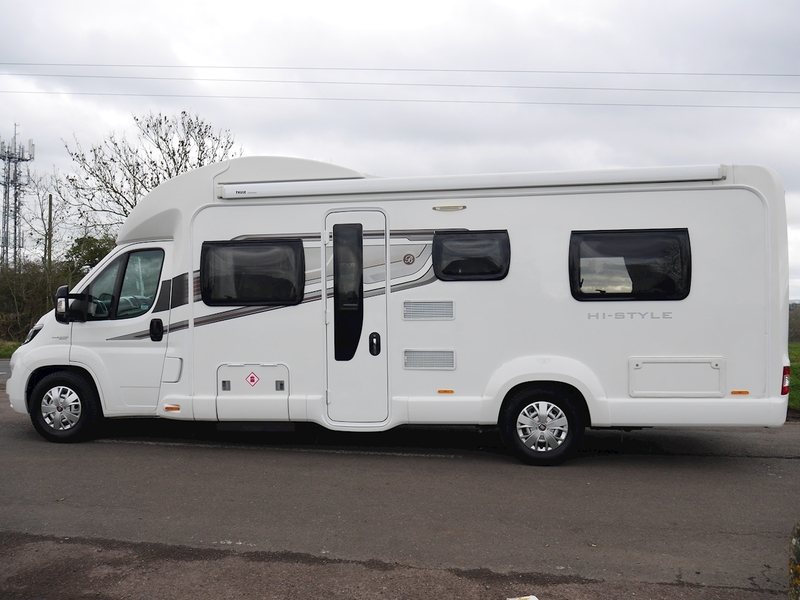 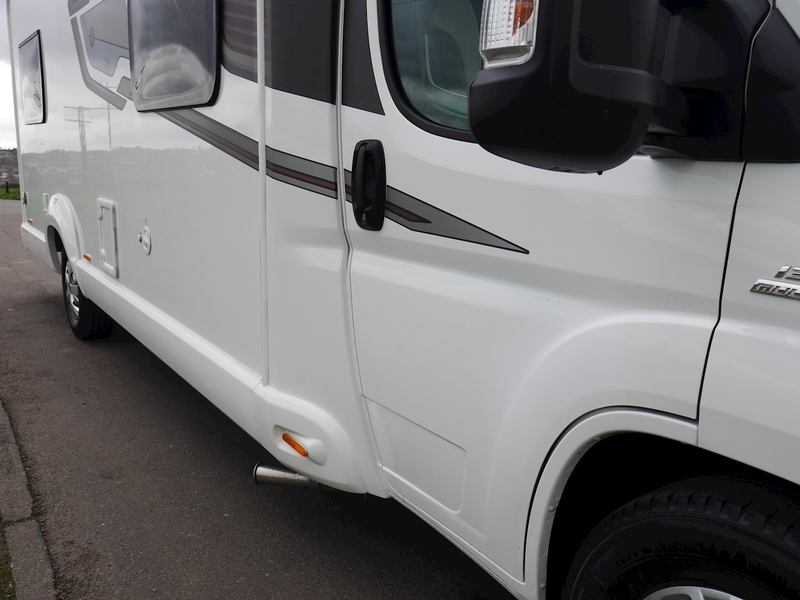 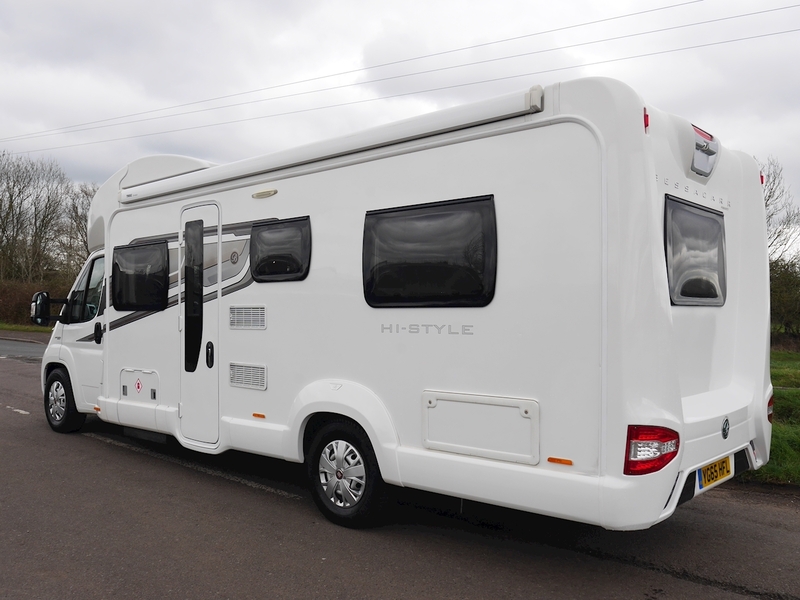 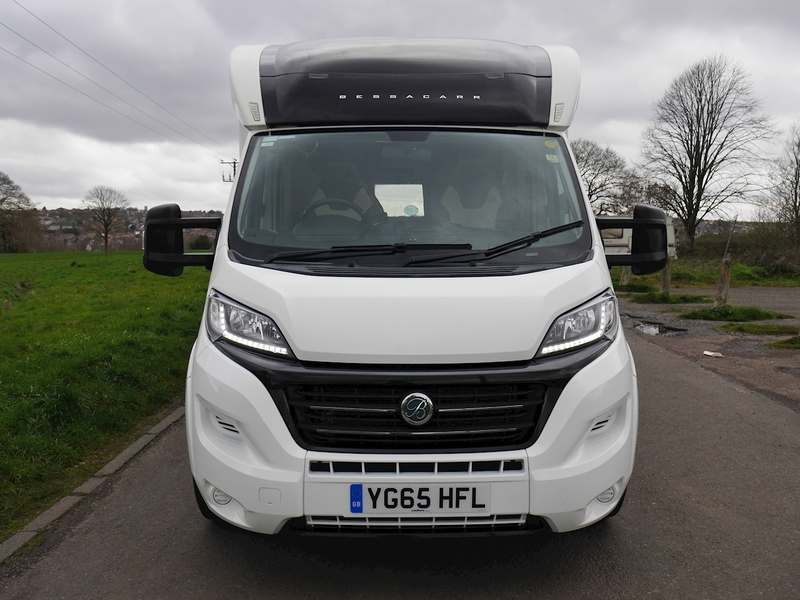 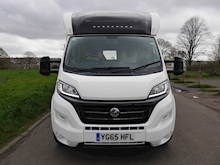 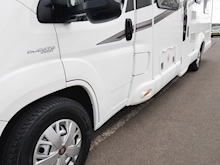 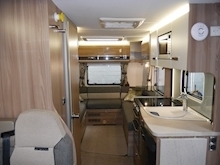 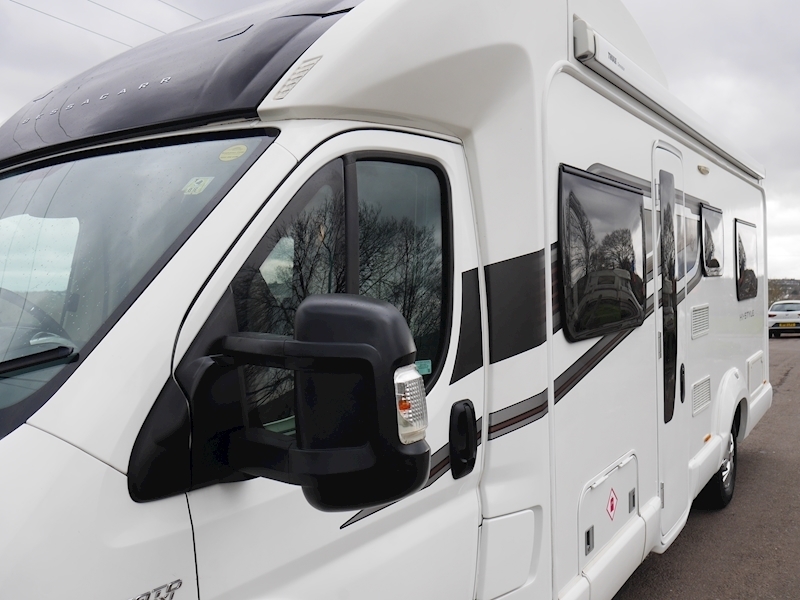 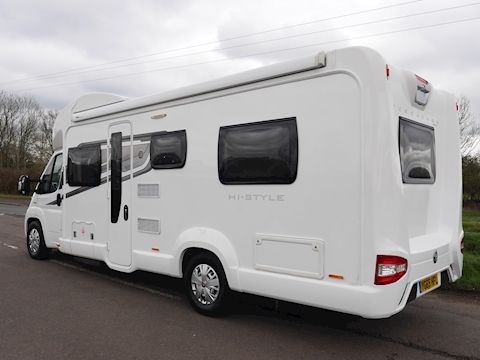 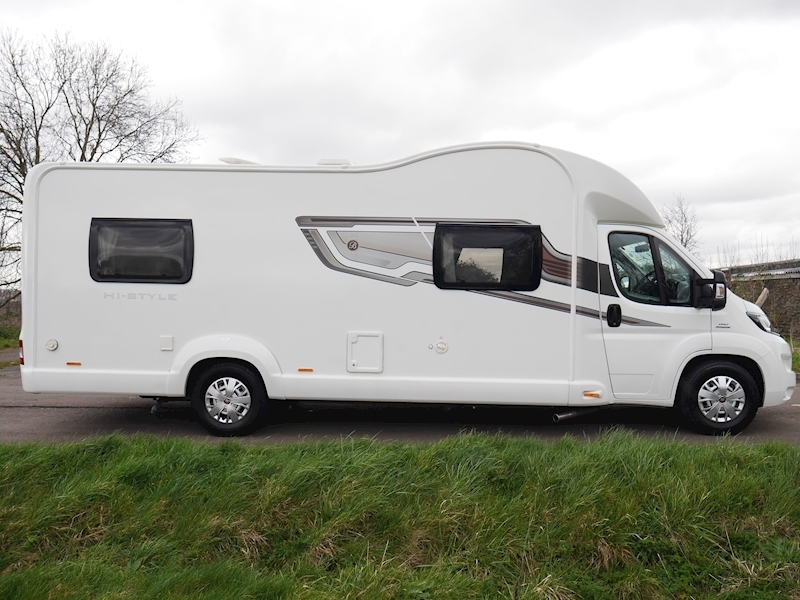 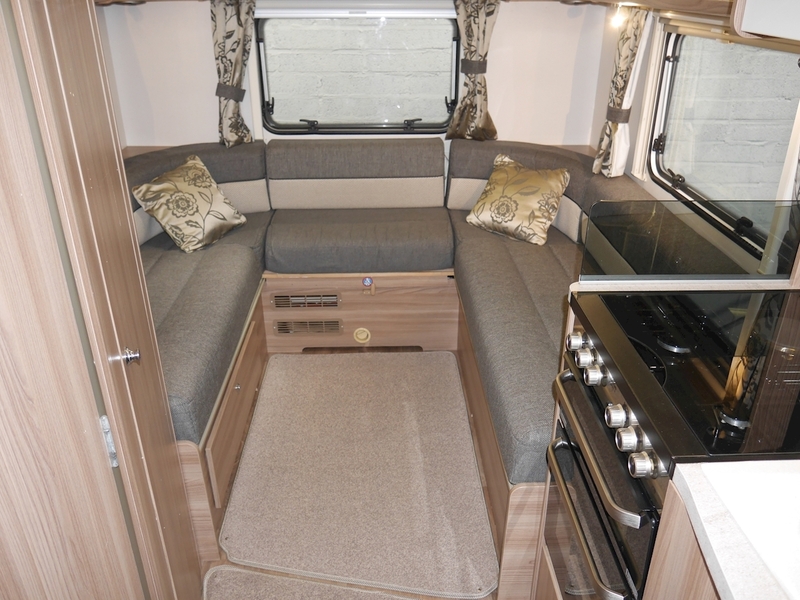 This 2015 Bessacarr Hi-Style 496 is a high quality six berth motorhome, positioning a front lounge with electric drop down bed above, central kitchen and an end lounge. 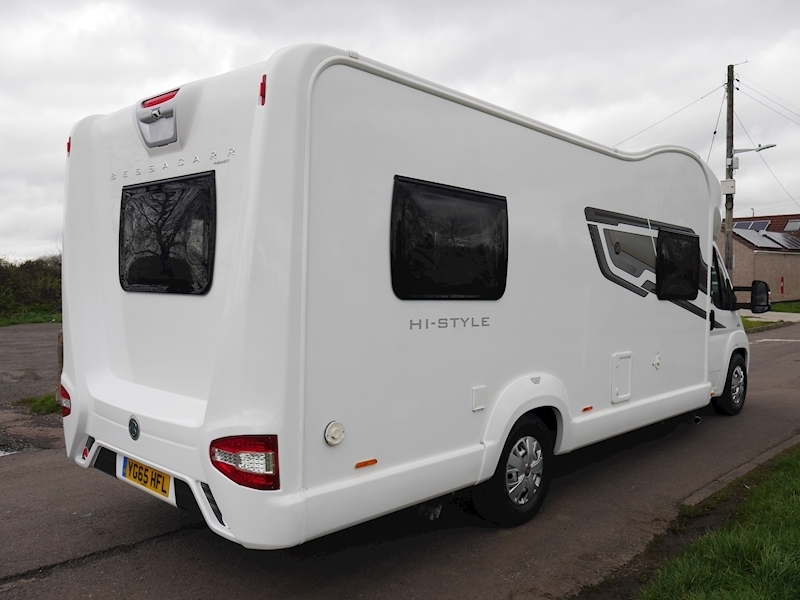 The Hi-Style is designed off the base 496 and incorporates more than £3,000 worth of additional equipment. 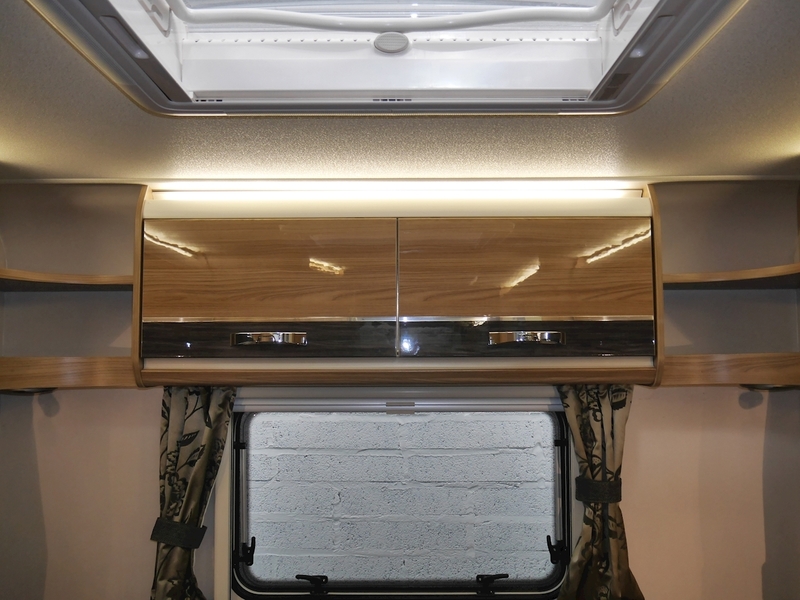 Externally, the 496 distinguishes itself most obviously by the gentle roofline hump just aft of the cab in lieu of the overcab moulding. 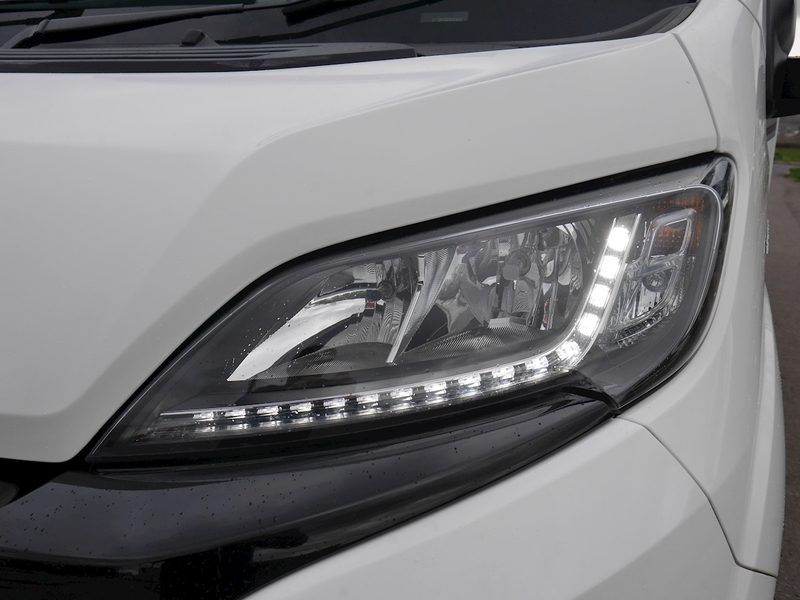 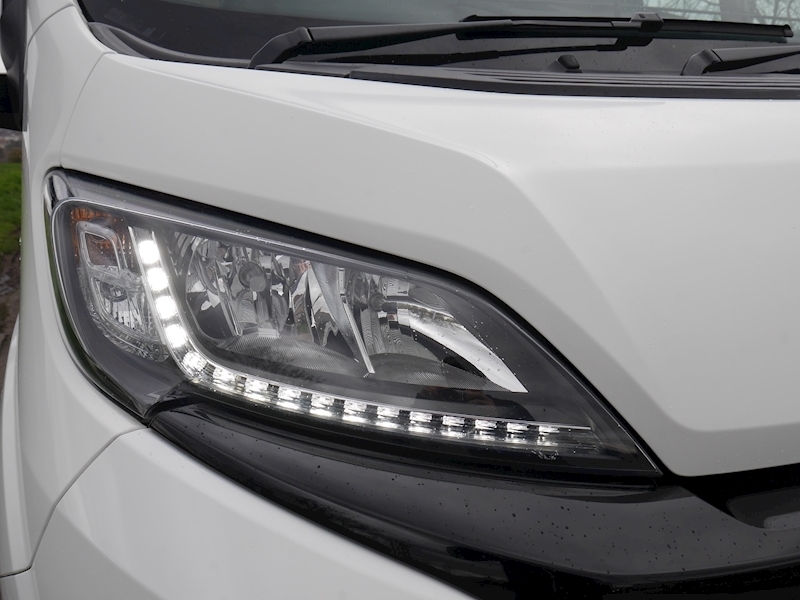 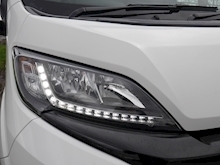 The neat graphics scheme enhances the exterior appearance further, whilst LED daytime running lights provide a sleek touch when on the road. 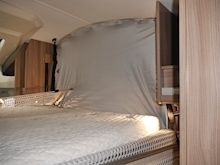 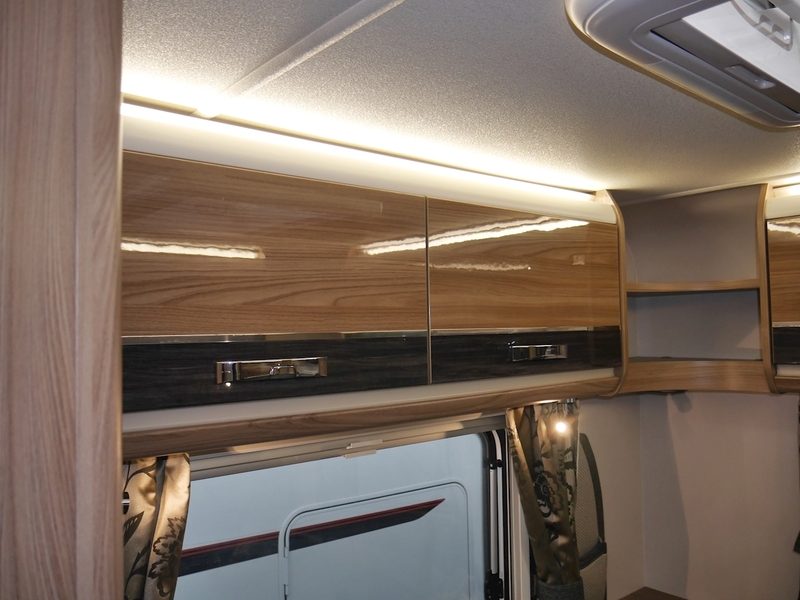 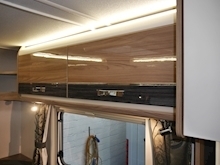 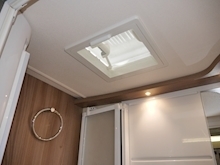 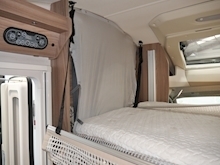 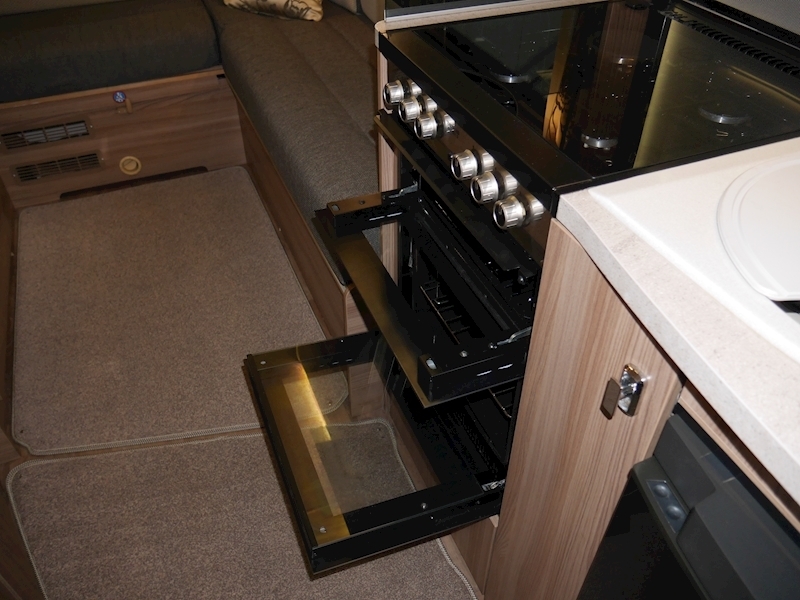 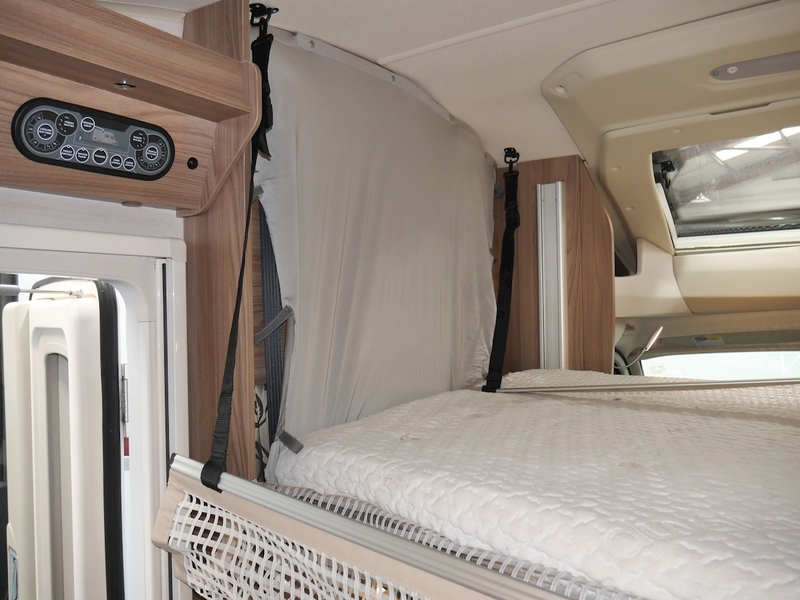 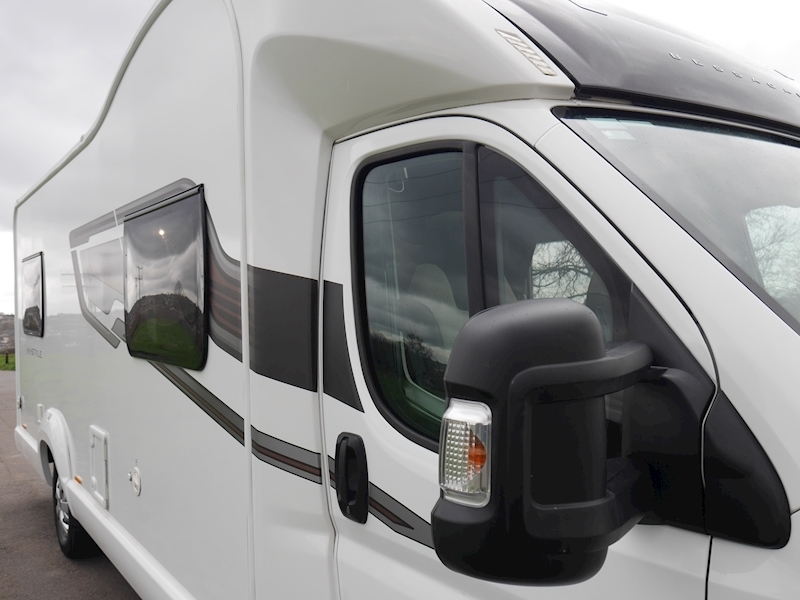 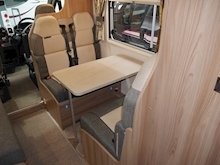 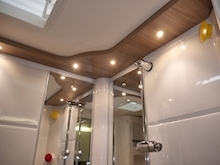 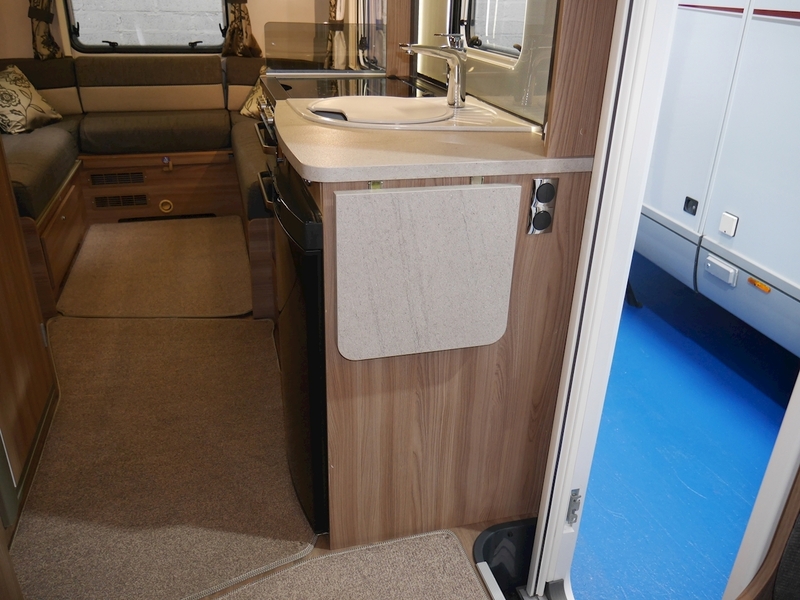 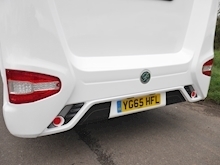 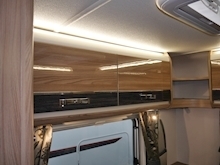 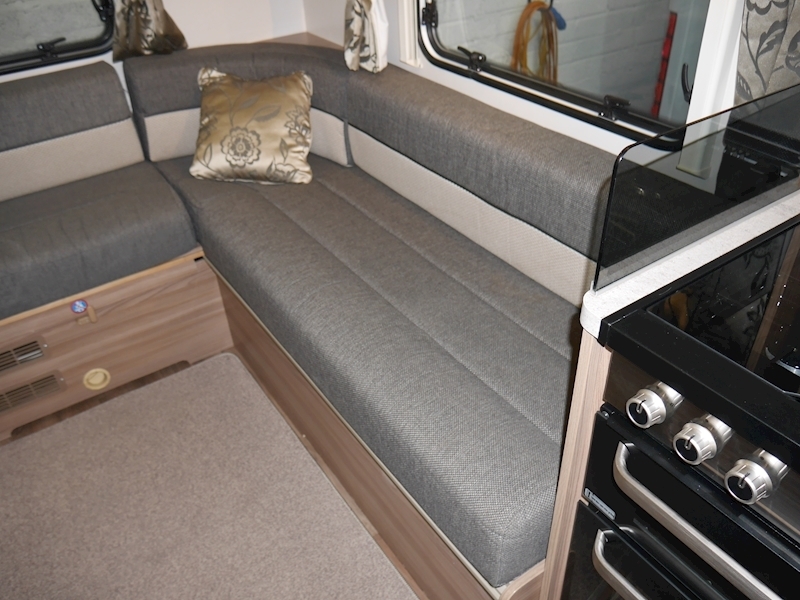 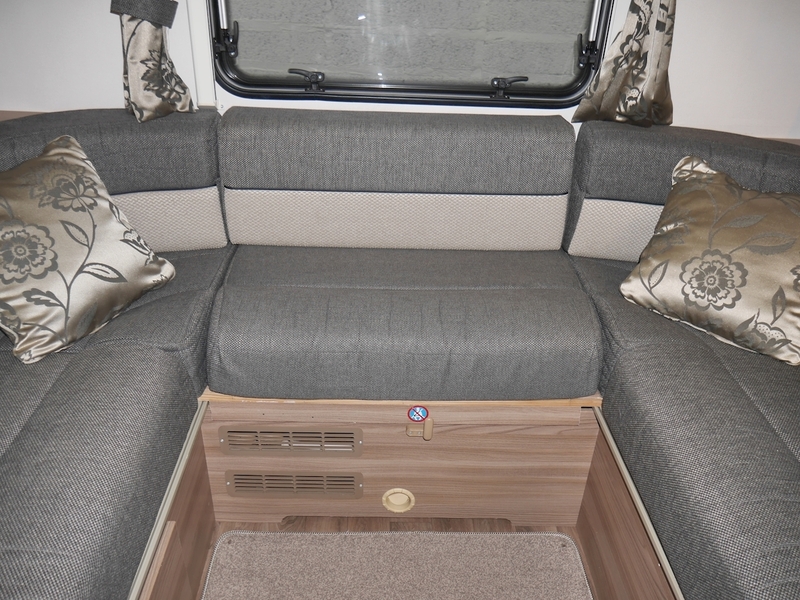 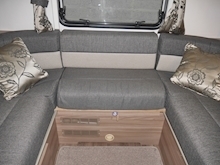 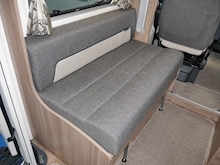 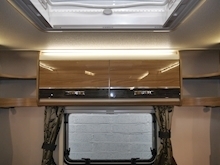 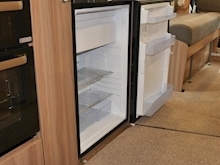 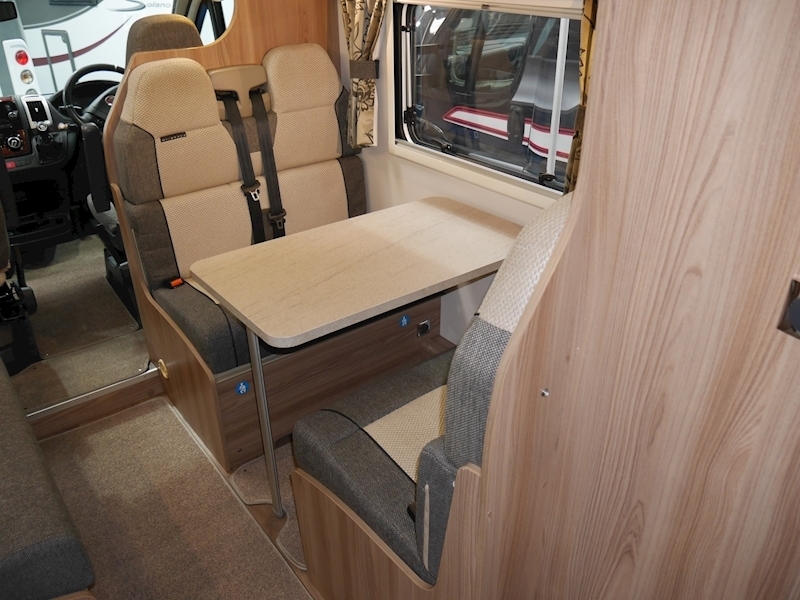 Taking a look on the nearside you will find a fully reinforced habitation door, with a Thule Omnistor roll out awning fitted above, which is neatly integrated into the build of the motorhome. Additionally, the gas cylinder locker and an exterior storage locker can be found on the nearside. 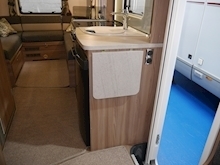 Moving over to the offside you will find the remainder of the standard equipment within the electric hook-up point, water inlet point and the Thetford toilet locker. 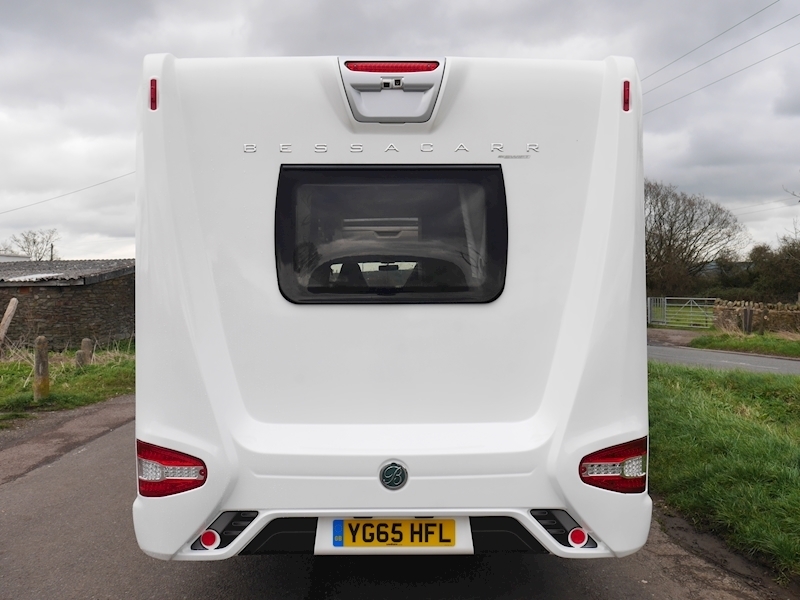 At the rear of the 496 is a dual-lense reversing camera, whilst the roof-mounted solar panel provides support to the leisure battery. Typical of the Bessacarr brand, the interior of the 496 is of a very high standard. The gloss wood finish is second to none, whilst the premium upholstery provides high levels of comfort throughout. 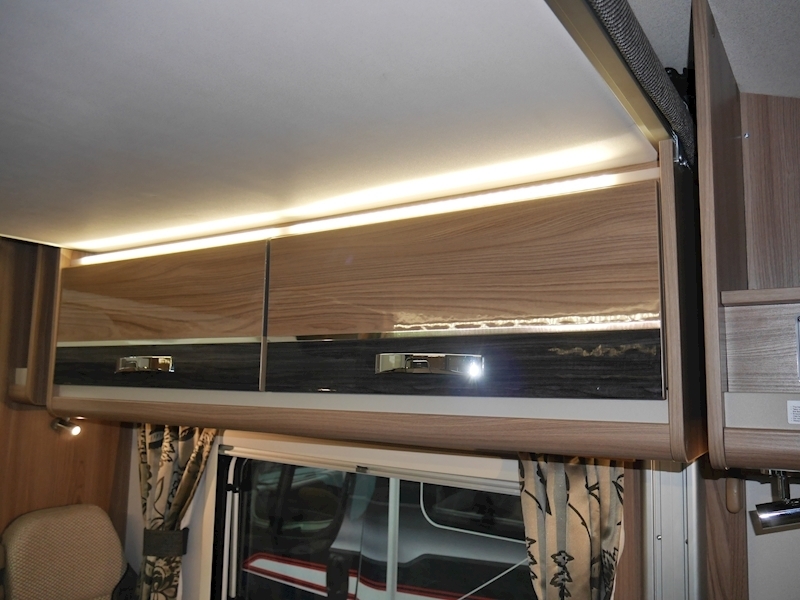 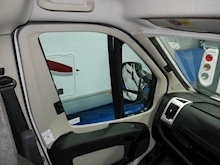 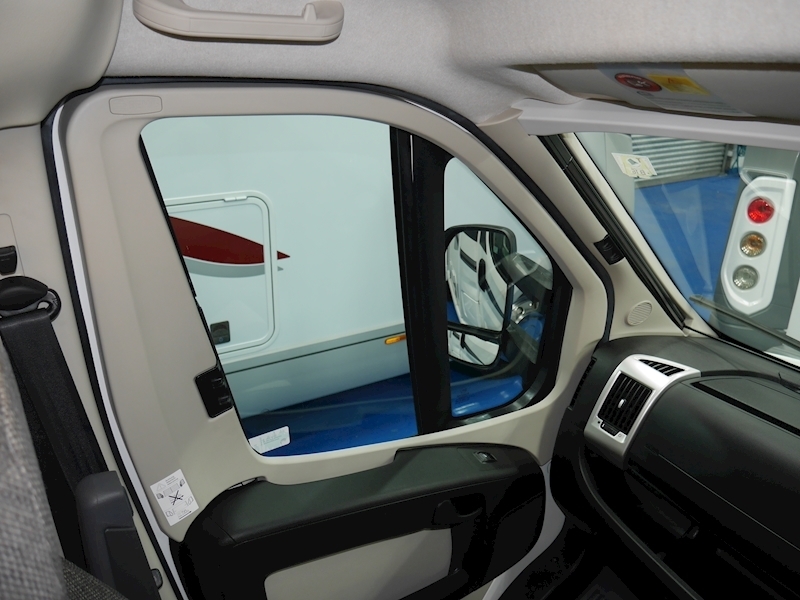 Taking a look at the front cab area you will see that Remis cab blinds are fitted, enclosing the area at night. 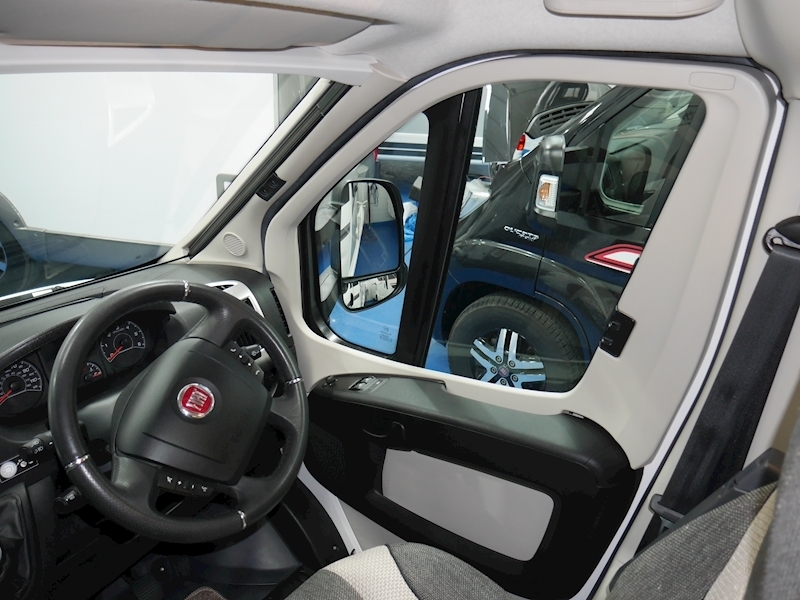 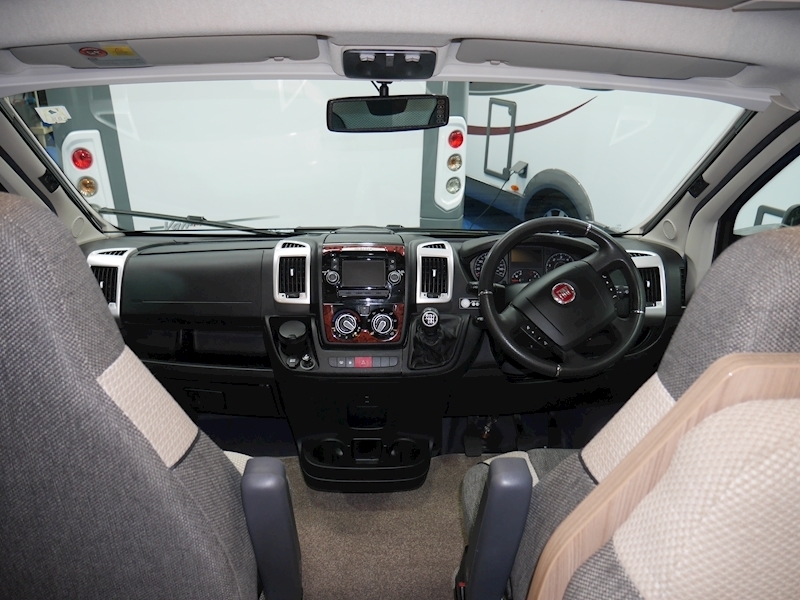 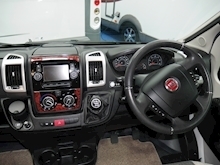 Elsewhere the Hi-Style pack brings with it a host of additional equipment, including a multi-function steering wheel, cruise control, cab air conditioning and a stereo upgrade that comprises a fully integrated DAB radio, a CD player, a touch-screen sat-nav and Bluetooth phone connectivity. The base vehicle of the Bessacarr is the Fiat Ducato 2.3Jtd 130, six speed, which has covered just 20,500 miles from new. 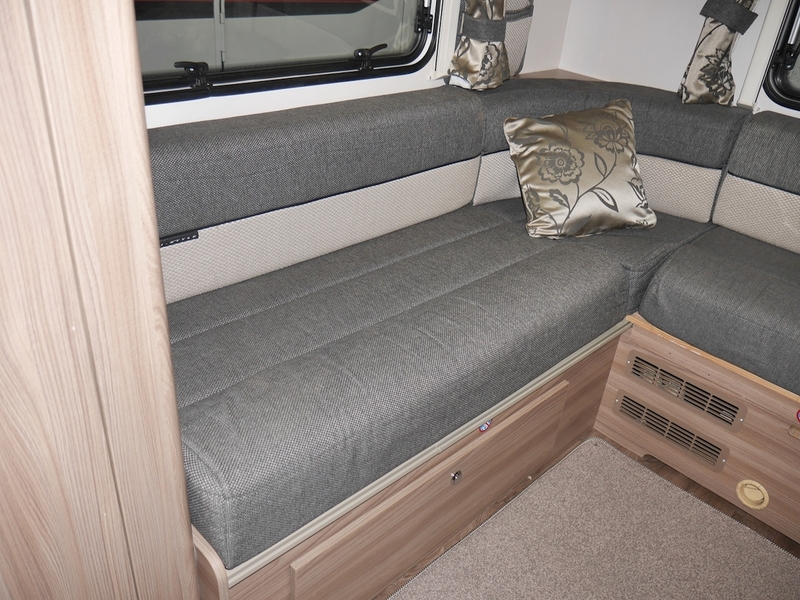 The lounge area is just behind the cab and consists of twin facing bench seats and a side sofa. 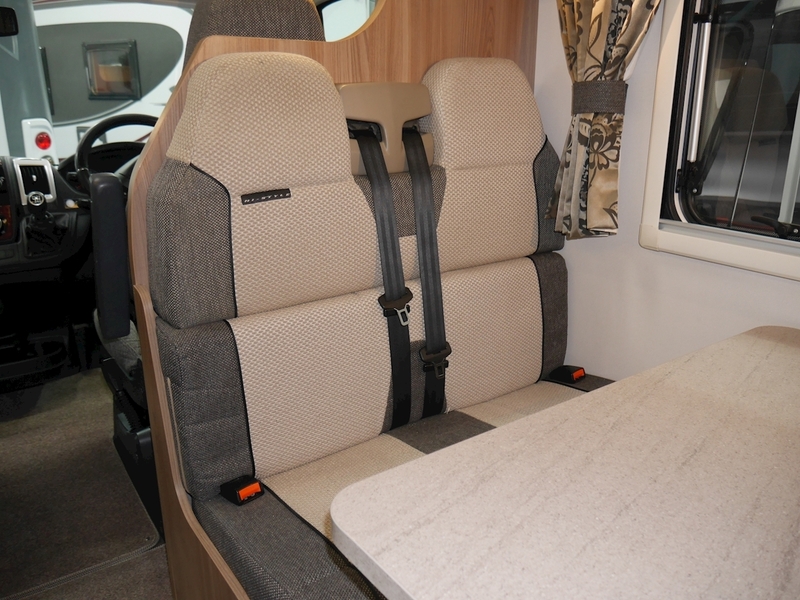 Both the forward facing and rear facing seats are equipped with two three-point seat-belts, meaning a total of six can travel belted. 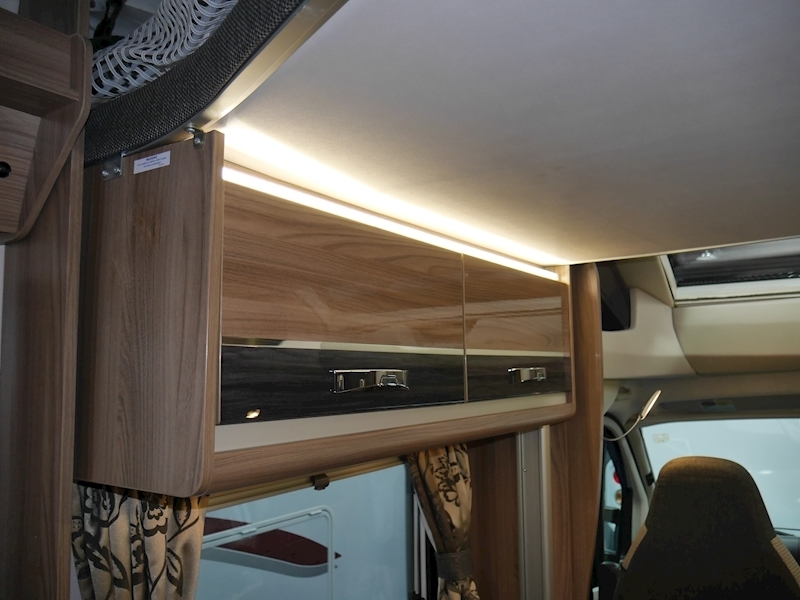 For lighting there are windows either-side and an impressive electrically operated sky-light. 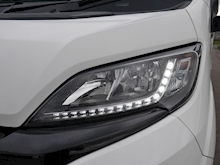 LED spot lights and strobes provide ambience when it is darker. 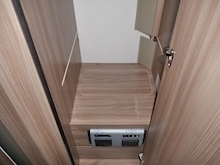 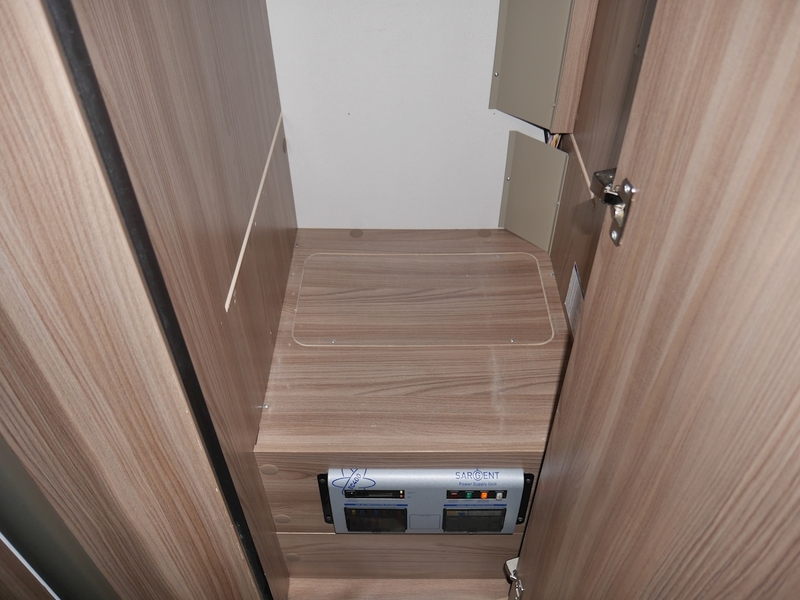 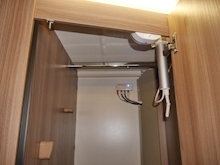 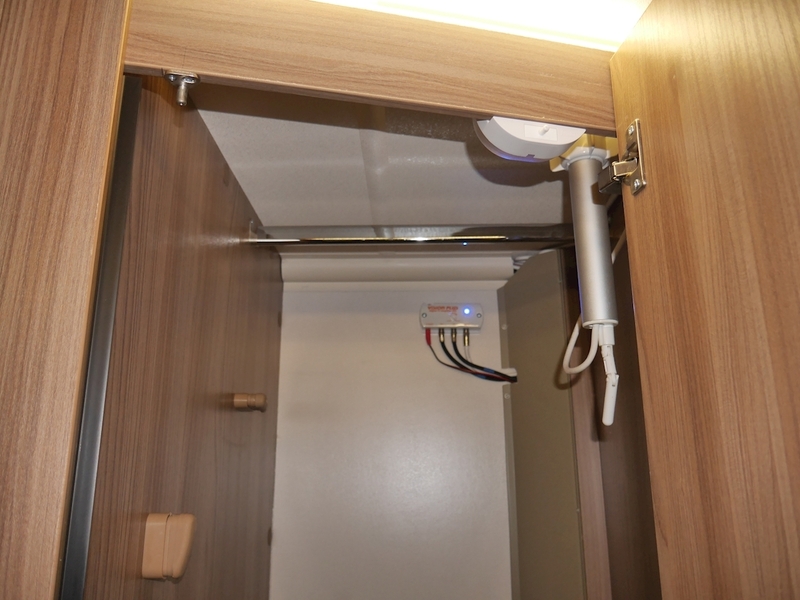 Storage is provided through overhead lockers and space beneath the seating, whilst the area has the ability to configure into a sleeping arrangement if required. 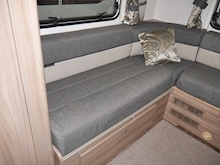 The table lowers and the cushions fold down, creating a comfortable double bed. 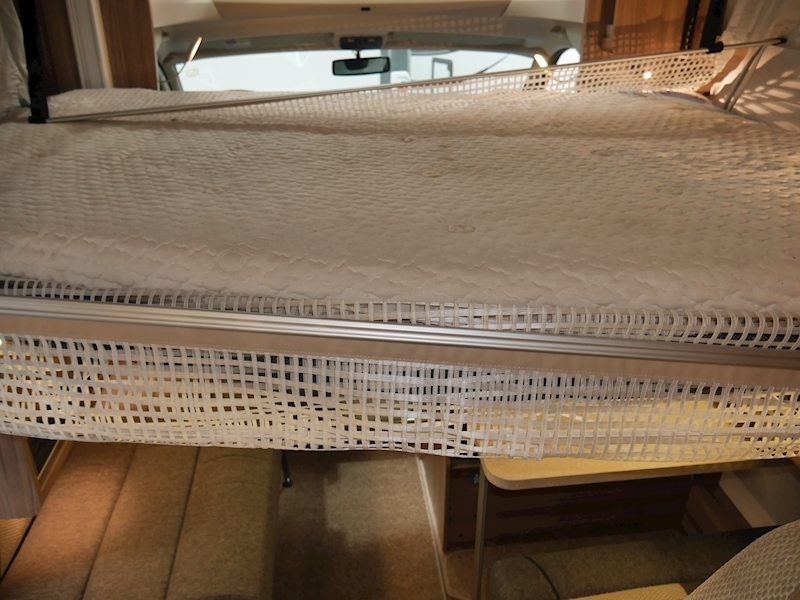 of the bed stretch taut to protect occupants from the surrounding cabinetry and the bed can be fixed at almost any height. 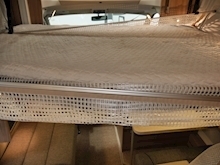 You also get a ladder if the ‘downstairs bed is in use. 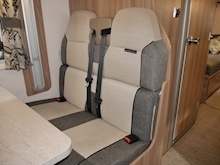 If not, it can drop to a suitably low level, once you’ve removed the settees’ seat backs. The kitchen comes equipped with all the appliances required to comfortably make a meal. 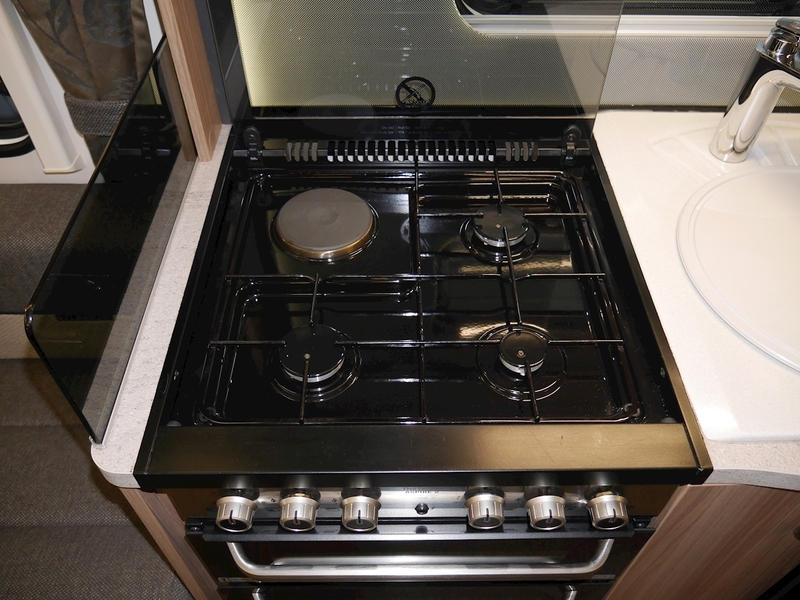 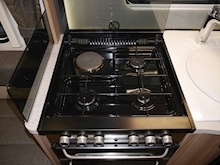 On the left hand-side there is a full-sized oven/grill unit, with a three burner hob and electric hotplate integrated above. 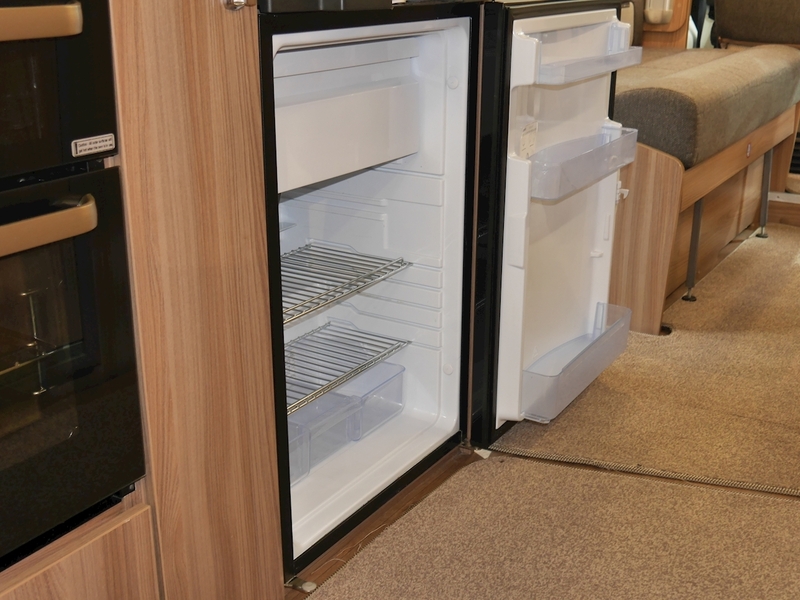 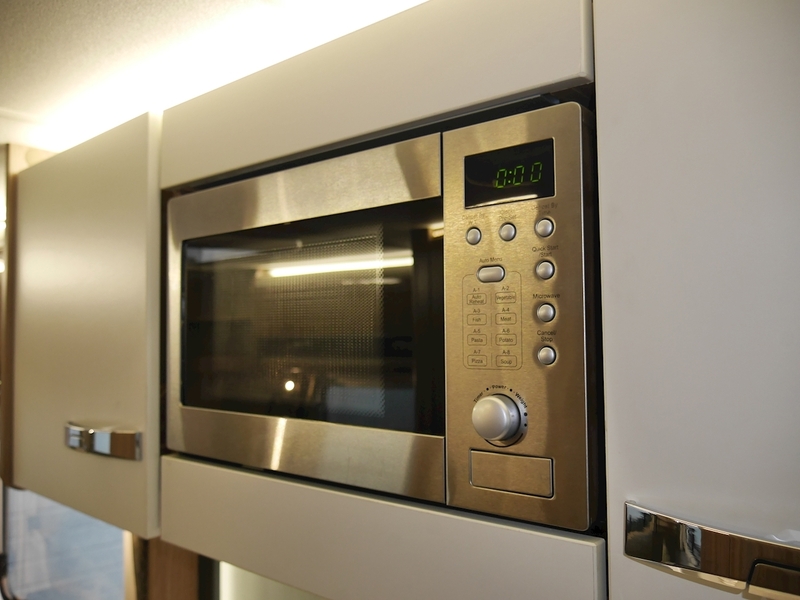 To the right is a Dometic dual-fuel fridge freezer unit, whilst a stainless steel microwave is found at eye height. 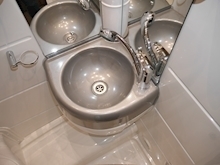 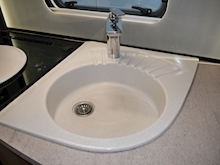 The sink unit comes equipped with a drainer and a chrome mixer tap, whilst storage facilities can be found within cupboards, drawers and overhead lockers. 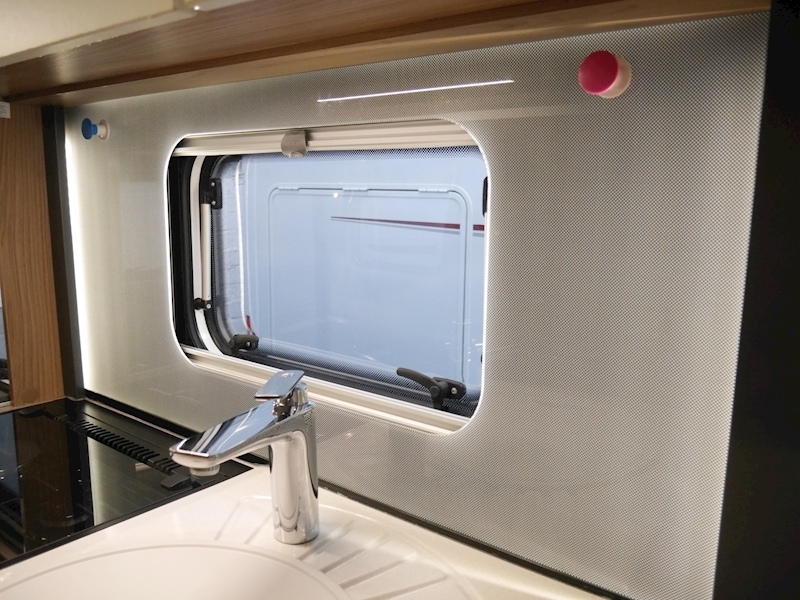 A 230v plug socket is conveniently located for a kettle, whilst there is a fold up extension piece on the right hand side, increasing your preparation space. 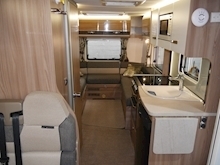 The end lounge area is the main social setup within the motorhome. 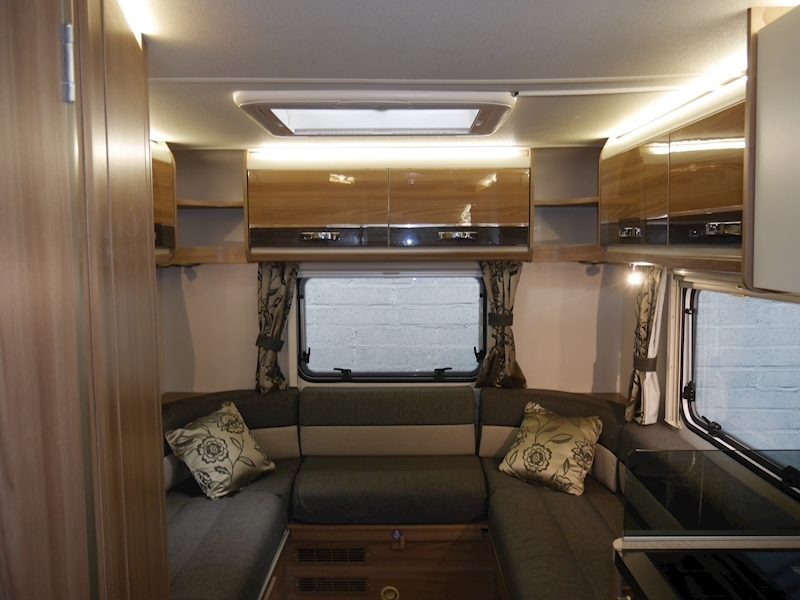 U-shaped wrap around seating provides flexibility and comfortability, whilst the area is sumptuously lit via surrounding windows and a Heki. 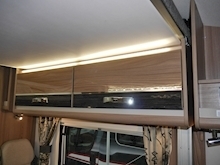 When it is darker, an assortment of LED's prove very effective. 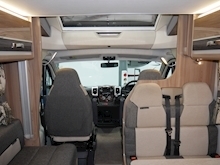 Again storage is provided in good numbers, you have overhead lockers and plenty of space beneath the seating, with the nearside being accessed from the outside too. 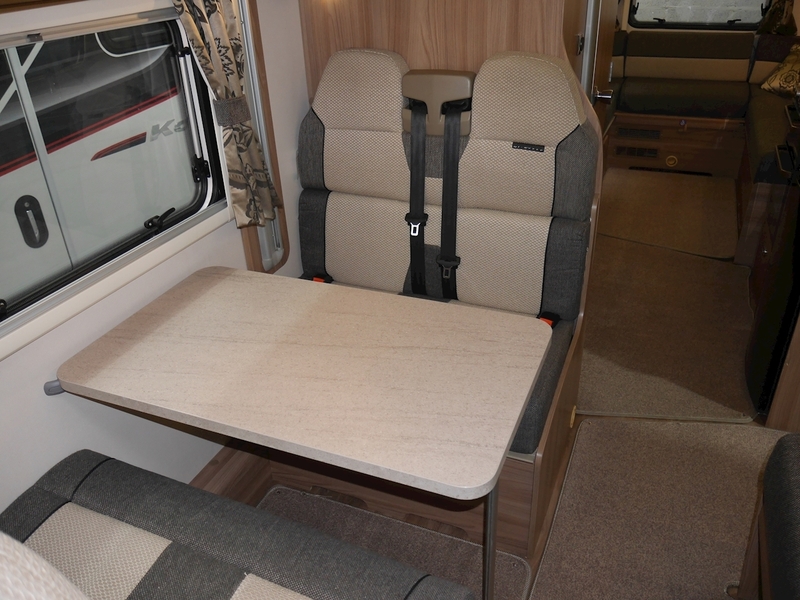 There is an additional freestanding dining table, whilst a huge double bed can be configured when required. Entering through the door opposite the kitchen, you will find the washroom arrangement. 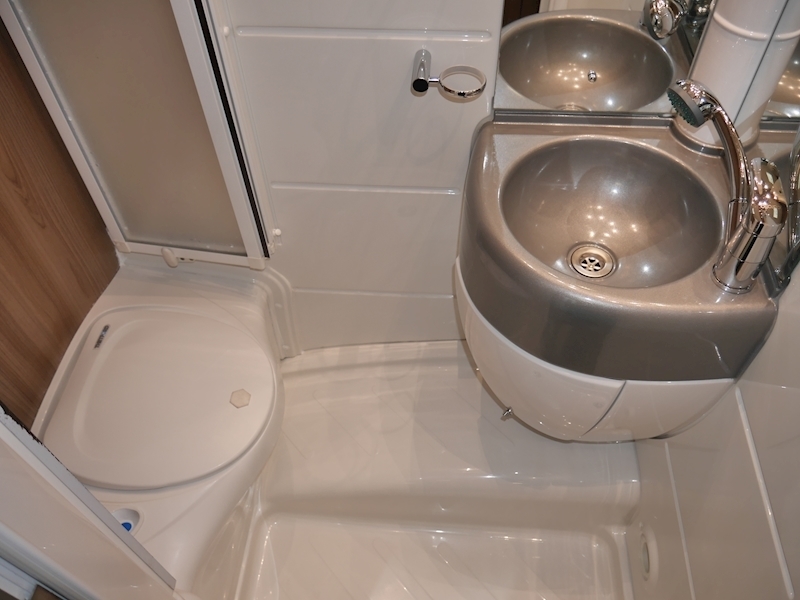 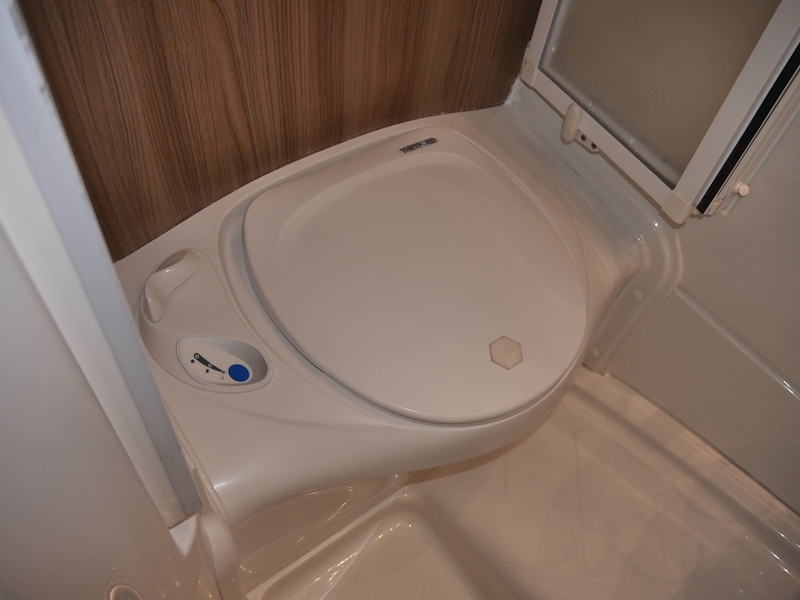 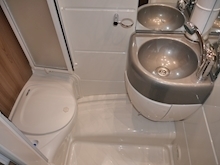 Inside, there is a Thetford electric flush toilet, along with a circular wash basin to the right, which has a vanity unit and a chrome tap (which also becomes your shower head). The area is ventilated through a mini Heki.